Canadian parts giant Magna International says it now has the ability to manufacture U.S. military-grade radar for the auto sector, allowing automakers to close the gap between Level 3 and Level 5 autonomy. Magna’s Chief Technical Officer Swamy Kotagiri made the announcement at the North American International Auto Show on Monday. “Our Icon radar takes the best of military technology and improves on it for automotive use – taking a significant step forward toward full autonomy,” Kotagiri said. The radar has multimode capabilities, scanning horizontally and vertically while creating a high-definition, four-dimensional view. Magna has been collaborating with Uhnder, which it calls “a technology start-up currently in stealth mode,” in engineering and product development to help bring the new technology to market in 2019. The advanced radar technology can detect and track almost 100 times the number of objects more than competitive systems and individually classifies them, Magna says. While the global parts supplier says the new radar will help automakers reach Level 5 autonomy more quickly, the new technology will improve automatic emergency braking in the near-term. 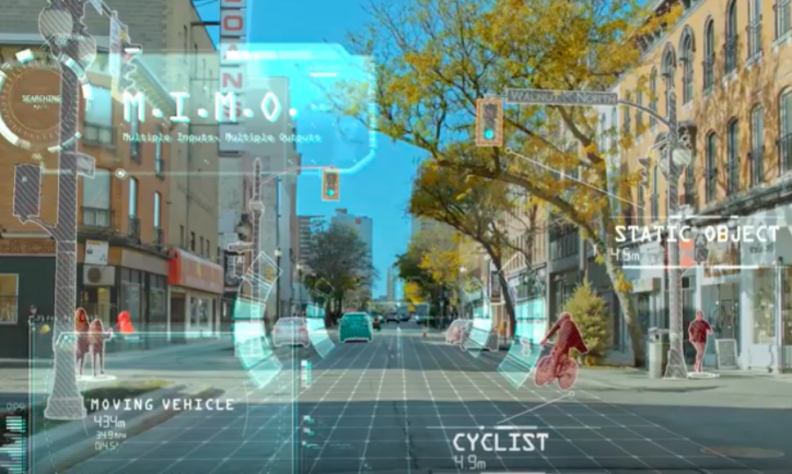 Having the ability to distinguish smaller ‘objects’ such as children and bicyclists in close proximity to larger, more easily detectable things, such as parked cars and moving trucks, is critical to the enhancement of safety ADAS features, Magna says. The radar “which helps a vehicle make instantaneous decisions in response to complex surroundings,” the company said. It also exceeds any current government regulations.